^ a b c Cole, Amy M.; Cox, Sean; Jeong, Choongwon; Petousi, Nayia; Aryal, Dhana R.; Droma, Yunden; Hanaoka, Masayuki; Ota, Masao; Kobayashi, Nobumitsu; Gasparini, Paolo; Montgomery, Hugh; Robbins, Peter; Di Rienzo, Anna; Cavalleri, Gianpiero L. (2017). 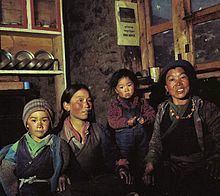 "Genetic structure in the Sherpa and neighboring Nepalese populations". BMC Genomics. 18 (1): 102. doi:10.1186/s12864-016-3469-5. ISSN 1471-2164. PMC 5248489. PMID 28103797. This article contains quotations from this source, which is available under the Creative Commons Attribution 4.0 International (CC BY 4.0) license. ^ "G20 meet: What role does the Sherpa play in the negotiations?". The Indian Express. 6 September 2016. Retrieved 7 October 2018. ^ McCarthy, Julie (24 April 2014). "Sherpas Walk Off The Job After Deadly Avalanche". NPR. ^ The Associated Press (21 April 2014). 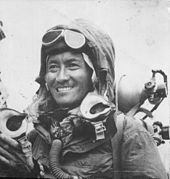 "Sherpas Consider Boycott After Everest Disaster". NPR. ^ "When you call someone a Sherpa, what does that mean?". Public Radio International. Retrieved 7 October 2018. ^ "1953: First Footsteps - Sir Edmund Hillary and Tenzing Norgay". National Geographic. Retrieved 1 August 2014. ^ "Four Confirmed Dead in Two Day on Everest". 21 May 2012. Retrieved 23 May 2012. This page was last edited on 22 April 2019, at 13:30 (UTC).